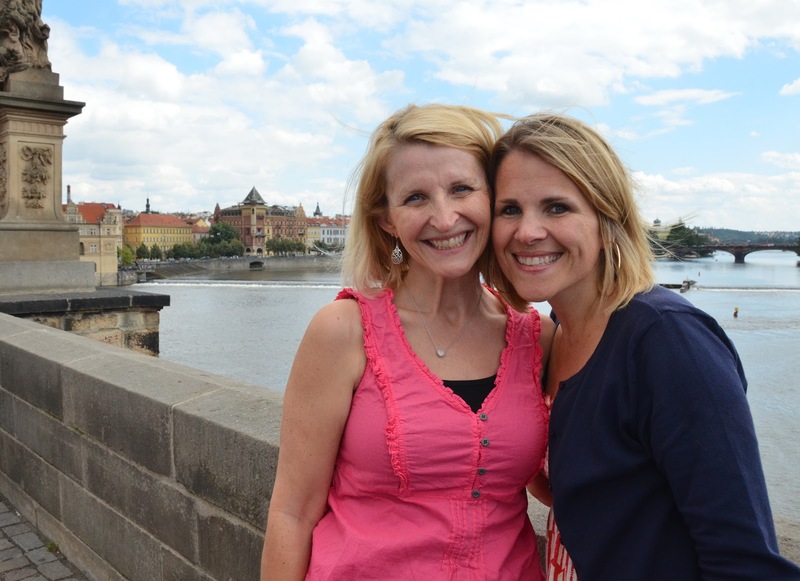 Though we just returned from the States, Claire and I were off to Prague just a few days later to meet up with our dear friends, Amy Chase and her daughters, Allyson and Haley. Who should we run into at the Prague train station while waiting for the Chase girls to arrive? Our dear Irena! She was in my first girl's Bible study nearly 19 years ago. Sometimes it feels like Prague is a small city when things like this happen. It was great to see the Chase girls get off their train from Bratislava. These are long time friends from Ft. Collins, CO who are now with JV in Slovakia! Rain in July. Pretty typical for the Czech Republic. Did you know that July is our wettest month? But thankfully we woke up to sunshine the next morning from our sixth floor apartment on Wenceslas Sqaure...what a view to wake up to. And a bargain apartment at that! A little coffee from our new favorite shop, Costa Coffee, and we were good to go! And one of Amy and I on the Charles Bridge. We've wished for a long time the gift of sharing life together. What a fun surprise from the Lord to do it in ministry, in neighboring countries!